HAPPY BIRTHDAY CRUMBS AND CHAOS! As we enter our 3rd year of blogging, we want to get into the mood for celebration by sharing with you a very special dessert! Stay tuned later this week for a little birthday giveaway. A few weeks ago, my dad took my boys and me out for dinner. He chose a local Mexican restaurant and after stuffing ourselves with tacos and tostadas and a cheese crisp, we decided that on this rare occasion we were going to get dessert. I asked a few of the employees and got a hands down recommendation for the fried ice cream. How could I resist that? So knowing that we were going to be doing a Cinco De Mayo week and it would include our birthday I knew this was the dessert for such an occasion. It is not the fastest process because of the multiple freezing times, but the actually cooking happens in a flash and I’m sure you won’t be disappointed! 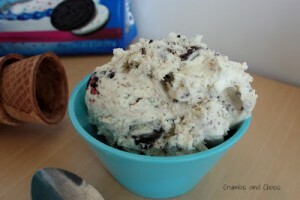 It has a wonderfully warm and chewy crust the oozes with ice cream. We served ours topped with honey, whip cream, and strawberries. 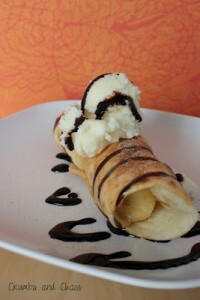 I also think it would be wonderful drizzled with chocolate syrup or with a variety of fruits. Just like an ice cream sundae the possibilities are endless! 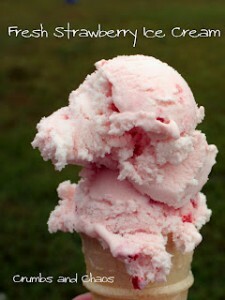 Make 5 scoops of ice cream, approximately 1/2 cup each. Place on a pan or baking sheet lined with waxed paper and freeze for at least one hour. Meanwhile, in a shallow bowl add crushed corn flakes, coconut and cinnamon. Stir together. Set aside. In another shallow bowl, beat egg and milk together, set aside. Remove ice cream from the freezer and roll and press the corn flake mixture around the ice cream, packing it together as if making a snowball. Then roll the ice cream ball into the egg mixture then back into the corn flake mixture. This makes for a thicker, chewier crust. Return to the freezer for at least one hour or until the ice cream is VERY hard. Heat oil in a heavy pot until the temperature reaches 365 degrees. Remove the ice cream balls from the freezer and carefully drop into the hot oil. Deep fry for ONLY 20-30 seconds. Remove from the oil and place on a dish or in a bowl. Top with you favorite toppings. I haven’t had fried ice cream in years. We used to go to a local mexican restaurant as teenagers and always order this!!! 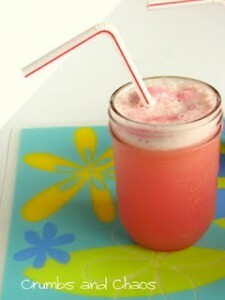 Love that you can make it at home so easily…although I have never heard of the egg mixture. Happy Birthday! Thanks for sharing this recipe. Happy blogiversary! I’ve never had this but jeez it sounds good. Happy Birthday! I certainly enjoy your blog. Happy Birthday!!! 🙂 Three is a great accomplishment. Happy Birthday! Yum! The fried ice cream looks so good! I haven’t had fried ice cream since I was in my early 20’s. I used to order it all the time from Chi-Chi’s! Happy Birthday! I love Fried Ice Cream but have never tried to make it. I think that may have to change soon. THanks for sharing. 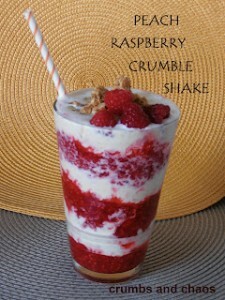 I just saw this on Sweet Tooth Friday…must give this a try! Yum Yum!!! I just found your blog on Mrs Foxs Sweets. I’ll host a party every month with a different theme and would love you to join! Please visit my blog for more information on “My Sweet Party” post uploaded 2nd of May. CONGRATULATIONS!!! 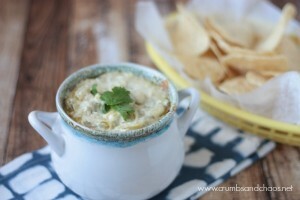 Your recipe is being featured today on Menu & Party Idea Round Up! Thank you for sharing your recipe with us at Cast Party Wednesday #39! Congrats!! You are doing great in blogworld! Love this fabulous and easy recipe. SO happy you shared at Weekend Potluck – please come again soon. 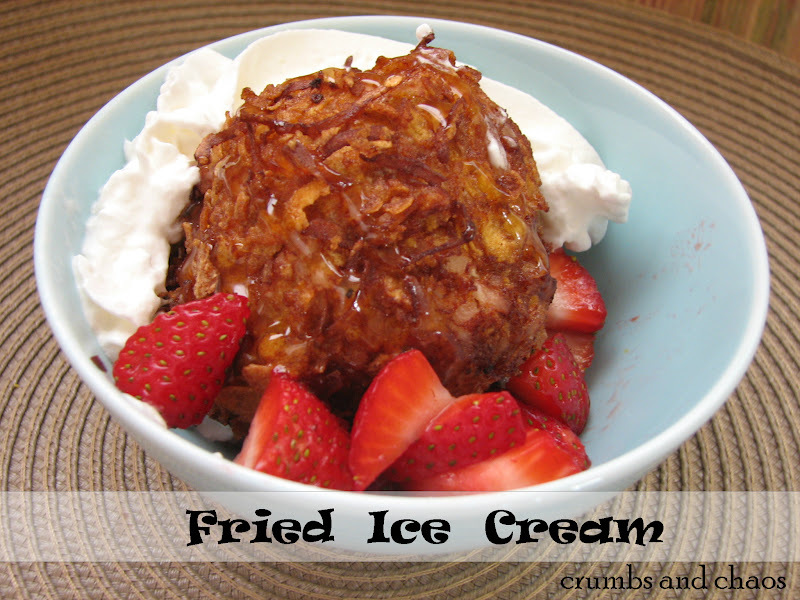 Man… I want to try my hand at Fried Ice Cream! Pinned 🙂 Thanks for sharing on Two Cup Tuesday at Pint Sized Baker!